I am saving all my creative energy for tomorrow's all day crop with SIS. Yeah, that's my excuse and I'm sticking to it. This is the only thing I made all last weekend that I even remotely liked. 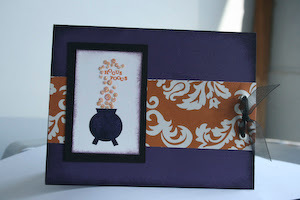 The stamp is from Savvy Stamps, I really love it. The paper is from the dollar spot at Target, although all the Targets around me seem to be sold out of it now. I used some glitter on the bubbles out of the cauldron. And I have been finding it in many unusual places all week, like my earlobe. Because the Target $1 paper is so thin, I used eyelets before I tied the organza ribbon otherwise it would probably rip. If I had a glue pad, I guess I coulda used that but I used a glue pen instead. Those with the glue pads...Is it really worth it? Do they work the way you want them to? 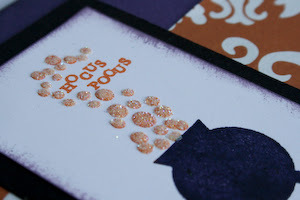 Love the glittery bubbles, this is really fun, I love it! This card is fab! Those bubbles are great! Cute card! I luv the sparkly bubbles!!! This is wonderful. I LOVE that background paper and love how you filled in the bubbles with glitter.